Britain has ruled out negotiations with militants holding a UK man in Iraq, after the hostage made a video appeal to Tony Blair to help save his life. Militants have threatened to kill Kenneth Bigley unless the US and the UK release all women held in Iraqi jails. Foreign Secretary Jack Straw said the hostage had been placed in an appalling situation by evil men, but this could not alter the UK's position. Meanwhile, two Italian women seized in Iraq are said to have been killed. In a message posted on the internet, a militant group calling itself the Jihad Organisation said they were executed because Italy had not withdrawn its forces from Iraq. There has been no confirmation of the report. The 11-minute video of Mr Bigley's plea was apparently made by the Tawhid and Jihad Group headed by al-Qaeda suspect Abu Musab al-Zarqawi. In it the hostage appeals to UK Prime Minister Tony Blair, saying: "You are the only person on God's earth who can help me." "I think this is possibly my last chance," he says, sobbing repeatedly. "I don't want to die... Please free female prisoners held in Iraqi prisons." Mr Bigley's relatives have urged the kidnappers "to be all merciful". The US is holding two female weapons scientists, Rihab Rashid Taha and Huda Salih Mahdi Ammash, but says it has no plans to release them. The UK says it has no Iraqi women in its custody. Mr Straw said the British government was doing everything to secure Mr Bigley's release but could not give in to terrorists. He added that it would be idle to pretend that there was a great deal of hope. Reacting to the video, he told the BBC: "It's adding torture to the appalling situation which these evil terrorists have placed Mr Bigley in. Of course our hearts go out yet more to him and his family. "[But] I'm afraid to say it cannot alter the position of the British government." After Mr Bigley's appeal, his son Craig, 33, issued in a statement to the kidnappers on behalf of the family: "Be merciful, as we know you can be. Release Ken back to his wife and family." Mr Bigley, 62, was among three Western civilian contractors kidnapped a week ago in Baghdad. 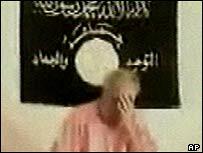 Video footage released on Monday showed American Eugene Armstrong being killed by a masked man thought to be al-Zarqawi. Jack Hensley, another US national, was killed 24 hours later and a video purportedly showing his killing was posted on Wednesday evening after his body had been found and identified. There was confusion on Wednesday after two Iraqi ministers announced that Dr Taha and Dr Ammash might be released. But Foreign Minister Hoshyar Zebari later told the BBC that Rihab Taha was a "highly valued prisoner" and there were "no immediate plans" to let her go. Dr Taha is said to have carried out top-secret work during the 1980s on germs that cause botulism poisoning and anthrax infections. 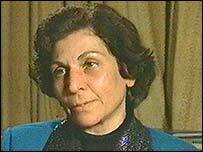 Dr Ammash, a biotech researcher, was on the US list of the 55 most-wanted members of Saddam Hussein's regime. "The women are still in the physical and legal custody of coalition forces"